Bass Pro Shops Sweet Maple Glazed Bacon Jerky 3 oz. Based on the flavorful, award-winning barbecue sauce, Bridgfords Sweet Baby Rays SWEET 'N SPICY beef jerky is a flavorful and tender jerky. 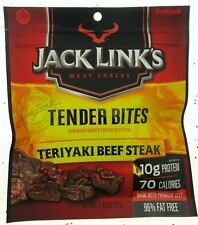 Delicious and tender beef jerky! DO NOT OPEN A CASE I RESOLVE ISSUES BETTER. Great high protein - low fat snack. About the product. Crafted in the U.S.A. No Artificial Ingredients/Minimally Processed. We start with premium, grain-fed Black Angus Beef that is naturally aged to give our thick cut steak jerky a distinct flavor, tenderness and quality like none other. From there, we add our special blend of fresh spices including garlic, pepper, and onion. Snap into salty and smoky flavor with every Slim Jim Original Deli-Style Smoked Snack Stick. Give in to your cravings with a smoky Slim Jim Original Deli-Style Smoked Snack Stick. Contains one 1.8 oz. Tasty Jerky 12 different types of meat. Big choice! High quality! Smoked Homemade Gourmet BEEF JERKY. Best RUSSIAN Jerky on eBay!!! Carolina Reaper Beef Jerky 2oz. Succulent and World's Hottest Jerky. Diabolical! Style: Smoked Beef Original Recipe w/ 100% Real Cheddar Cheese. Inventory: Alb262 A2 - 21. SALE 9.99$ Tasty Jerky 12 different types of meat. Big choice! High quality! All products are individually vacuum-sealed for freshness. 100% Real Bacon, Gluten Free. All Natural, No artificial ingredients. 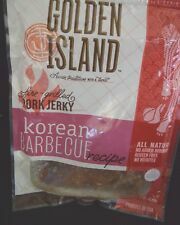 Style:Maple Glazed Pepper Turkey Jerky. Size: (1) 2.25 oz Bag. Best By Date: 03 / 23 / 2019. Our jerky is cut fresh, seasoned and smoked in a smoker with hickory wood. This is made fresh. I use only 100% beef, London broil or eye round only. SWEET GARLIC PEPPER BITES: This is a base garlic pepper flavor with a touch of brown sugar for sweetness. Original Beef Jerky. Natural meat From RUSSIA. 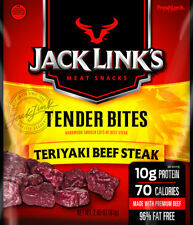 JACK LINK'S ARE CRAFTED WITH SWEET SEASONINGS AND ZESTY HOT SPICES! DO NOT OPEN A CASE I RESOLVE ISSUES BETTER. I CANT FIX IT IF I DON'T KNOW ABOUT IT! ITEM MUST BE UN-USED. Style:Honey Bourbon Brisket. Size: (1) 2.25 oz Bag. Best By Date: 03 / 20 / 2019. NEW-3 Pounds Klement’s Beef Summer Sausage Log, Great for Snack, Gift,or Party. Item: Beef Jerky. Flavor: Spicy. Net Weight: 500g. ~ 25 Slim Jim's ~.28oz each. Based on the flavorful, award-winning barbecue sauce, Bridgfords Sweet Baby Rays Original beef jerky is a flavorful and tender jerky. Delicious and tender beef jerky! DO NOT OPEN A CASE I RESOLVE ISSUES BETTER. 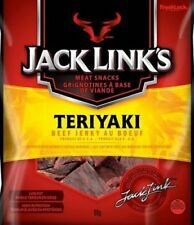 FEED YOUR WILDE SIDE WITH THE TASTE OF JACK LINK'S PEPPERED BEEF JERKY! DO NOT OPEN A CASE I RESOLVE ISSUES BETTER. I CANT FIX IT IF I DON'T KNOW ABOUT IT! Ingredients: Beef, Salt, Organic Cane Brown Sugar, Grape Seed Oil, Pepper. 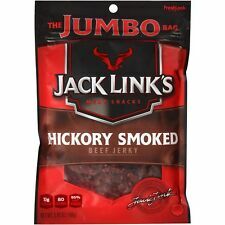 THICK CUT BACON MAKES UP THIS DELICIOUS HICKORY SMOKED JERKY FROM JACK LINK'S! DO NOT OPEN A CASE I RESOLVE ISSUES BETTER. I CANT FIX IT IF I DON'T KNOW ABOUT IT! 5 Packs Chefs Cut Smoked Turkey Teriyaki Jerky & Pepper Jack Cheese 1.35 Oz Ea. Krave Pork Jerky - Black Cherry Barbeque - Case of 8 - 2.7 Oz.